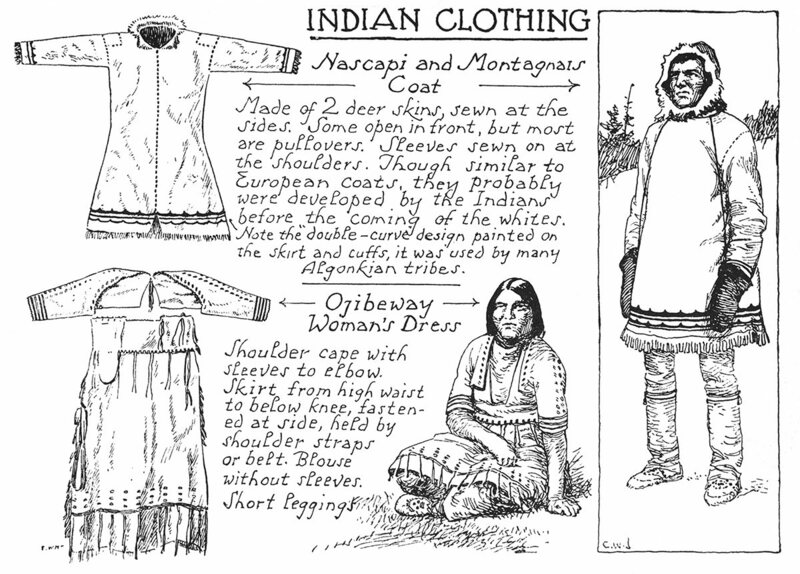 The clothing of the Indians varied according to the nature of the country which they inhabited. In addition to the skins of fur-bearing animals, which they used as robes, they also fashioned garments fitted to the body, illustrations of which are shown on these pages. It should be observed that the Indians of the woods never wore long and elaborate feather head-dresses as did the plains Indians. These would be quite unsuitable in the tangled underbrush of the forests and the bushes bordering the waterways. 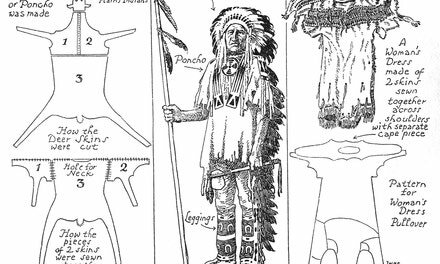 Pictures are incorrect which show Indians in the woods wearing western war-bonnets, instead of one or two feathers, which was their practice whenever they wore any at all. Only on a few ceremonial occasions did some of the woods Indians wear a sort of crown of feathers arrayed in a circle round the head; but this was never worn when travelling or hunting. Notches were sometimes cut in the feathers and their tips dyed with red to denote the rank of their wearers or to indicate some exploit. 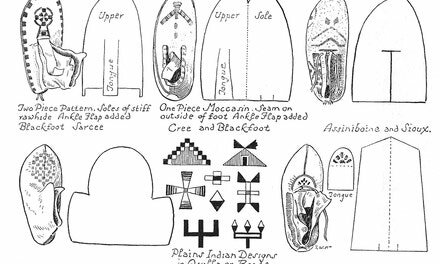 Moccasin patterns varied considerably, the principal difference consisting in the position of the seam joining the sole and the upper. In general the woods Indian moccasin was made large and loose, and had the sole drawn up well over the foot and puckered in front where the upper was sewn on just below the ankle. This type was adapted for travel in heavy snow, in wet weather and on swampy ground. The plains Indian moccasin generally had a stiffer, flat sole, sewn on to the upper around the foot, as in our boots and shoes. Usually these western moccasins fitted the foot more snugly, its front following its shape to a point at the big toe. Moccasins were often made from old mooseskin robes, which were greasy, and therefore resisted moisture better. Needles, awls, or bodkins were made from splinters of bone ground to a sharp point. Thin tendons and sinews of deer and other animals were used for thread.